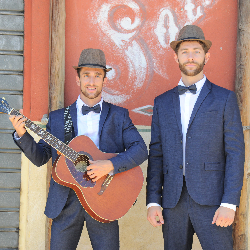 We are the Brotherockers, a French band created in 2015 by Jules and Pierre as an acoustic duo (Guitar/Cajon/Vocals). We are now giving more than 80 concerts a year, in pubs, restaurants, five star hotels, for weddings and private events. Originally created as a duo, The Brotherockers are now able to offer trio (double bass or bassist), quartet (trio + guitarist) and quintet (quartet + saxophonist). The bassist, solo guitarist and saxophonist that are part of the band are coming from one of the best music school in France. Therefore, The Brotherockers are now able to play more than 200 songs covering all periods and almost every style. The Brotherockers are in partnership with several DJs that are resident in some of the best clubs in the French Riviera and used to Marriages, private parties. Threfore, you can book the brotherockers for live music but also if you want to party on a DJ's music ! Feel free to contact us for more information !